Shoojit Sircar has managed to turn a singing, dancing, goofball called Varun Dhawan and shown us that the lad can get the audience to cry and laugh and be on his side. 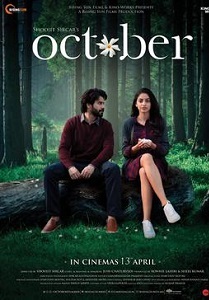 October is an unlikely film for Bollywood so used to boy meets girl and falls in love narrative, that a story about human empathy is rare. The film falters because it takes it own time and feels like it is stuck in a loop, but if you are patient, the reward is wonderful. No noise, no turbulence just flow with every rhythm of the film. A poetic journey that’ll warm your heart and might even want you to fall in love with the name Shiuli.